Race Winner: Ricky Stenhouse Jr.
· Ricky Stenhouse Jr. won the 48th annual GEICO 500 Monster Energy NASCAR Cup Series race at Talladega Superspeedway Sunday afternoon, the eighth different winner in 10 races this year. For Stenhouse, it is his first victory in 158 career Monster Energy NASCAR Cup Series races. It is his fifth top-10 finish and third top-5 in 10 races this year. 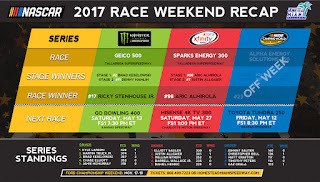 · It is Stenhouse’s fifth top-10 finish and third top-5 in eight races at Talladega Superspeedway. · Stenhouse is the first driver to win a race at Talladega starting from the pole since Jeff Gordon did it on April 29, 2007. He also is the 11th driver in NASCAR history to notch his first career Monster Energy Series win at Talladega. · The win snapped a 101 race winless streak for owner Jack Roush. Prior to today, Roush’s last win was secured by Carl Edwards on June 22, 2014 at Sonoma. · Jamie McMurray (second) posted his sixth top-10 finish and first top-5 in 10 races this year. It was his highest finish since he was second at Martinsville on November 1, 2015. It is his ninth top-10 showing and eighth in the top-5 in 30 career Monster Energy Series starts at Talladega Superspeedway. · Kyle Busch (third) posted his fourth top-10 finish this year and his seventh top-10 in 24 races at Talladega Superspeedway. It was his third top-5 of 2017. · Ty Dillon (12th) was the highest finishing rookie today. · Brad Keselowski won Stage 1 of today’s race, while Denny Hamlin captured Stage 2. · Kyle Larson (428) leads the point standings by 54 points over Martin Truex Jr. (374). They are followed by Brad Keselowski (367) and Chase Elliott (353). · With today’s win, Stenhouse becomes the seventh driver to qualify for the 16-driver field of the 2017 Monster Energy NASCAR Cup Series Playoffs. The list also consists of Kurt Busch, Brad Keselowski, Martin Truex Jr., Ryan Newman, Kyle Larson and Jimmie Johnson, each of whom has won at least one race this season. The Playoffs culminate with the Ford EcoBoost 400 championship finale on November 19 at Homestead-Miami Speedway. · Stenhouse has made five career Monster Energy NASCAR Cup Series starts at Homestead-Miami Speedway and has yet to finish in the top-10. He celebrated XFINITY Series championships at Homestead-Miami Speedway in 2011 and 2012. 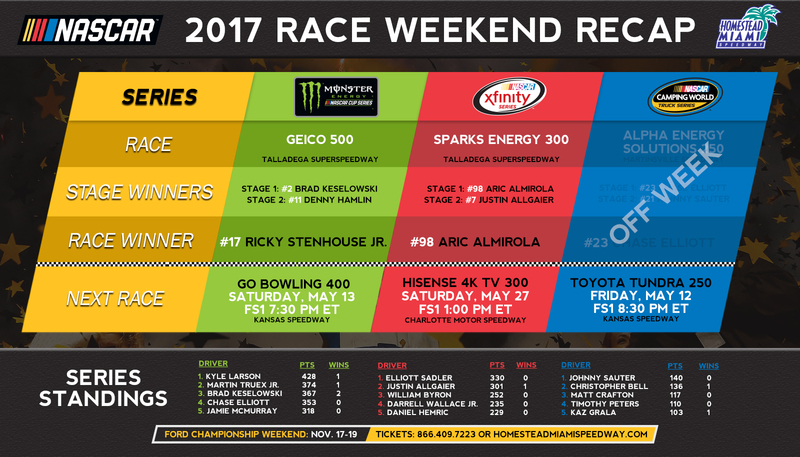 · Aric Almirola won the 30th annual Sparks Energy 300 NASCAR XFINITY Series race at Talladega Superspeedway on Saturday afternoon. It is Almirola’s third victory in 99 career NASCAR XFINITY Series races, and his first since July 1 of last year at Daytona. · It is his first victory and fourth top-10 finish in five career XFINITY Series races at Talladega Superspeedway. Almirola also won Stage 1 of Saturday’s race. · Elliott Sadler (second) accounted for his eighth top-10 finish in nine XFINITY Series races this year. It is his sixth top-10 showing in nine XFINITY Series races at Talladega Superspeedway. · Joey Logano (third) posted his seventh top-10 finish in eight XFINITY races at Talladega Superspeedway. · Matt Tifft (sixth) was the highest finishing rookie. · Justin Allgaier captured Stage 2 of the race. · Elliott Sadler (330) leads the XFINITY Series points standings by 29 points over Justin Allgaier (301). They are followed by rookie William Byron (252), Darrell Wallace Jr. (235) and rookie Daniel Hemric (229). · The Camping World Truck Series was off this weekend. They will resume action on Saturday, May 12 with the Toyota Tundra 250 at Kansas Speedway.